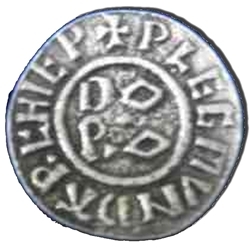 Our Medieval Coin Button is cast from reproductions of actual medieval coins which were minted by Archbishop Plegumund around 880 AD. Each button has a sturdy shank on the back. These buttons are cast from lead free pewter in the U.S. Each button measures 5/8 of a inch in diameter.